ARE YOU RECEIVING UNWANTED STUFF IN THE MAIL FROM THE FLDS? We have no connection to, or involvement with, the FLDS. We recommend that you send a complaint letter via postal service to the address from which you are receiving the FLDS mailings. The Fundamentalist Church of Jesus Christ of Latter Day Saints (FLDS) was founded in 1935 by two Mormons who had been excommunicated from The Church of Jesus Christ of Latter-day Saints (LDS), the main Mormon denomination. The main driving force for the FLDS founders was a desire to continue the policy of polygyny -- plural marriages involving one man and multiple wives. Polygny had formed an integral part of the original Mormon church founded by Joseph Smith. It is the policy of this website to simply explain the beliefs and practices of all faith groups without criticizing them. However, in rare instances, we see profoundly evil practices that must be condemned. So, we have deviated from our normal policy for the next two paragraphs. 1) Boys and girls are born into the FLDS at approximately equal rates. 2) Males in the FLDS are expected to have many wives. In order to maintain polygyny as the normal family structure, the FLDS must have many women available for each man. This can only be accomplished by getting rid of most males. This is typically done wrenching male youths from their family origin with a few minutes warning, driving them to another city, and dumping them there without any means of emotional or financial support. They are often referred to as the "lost boys." In essence, the Church creates thousands of orphans as a matter of policy. If you feel that this is consistent with Bible teaching, please go to http://www.biblegateway.com/ and read what the Bible says about the treatment of orphans. 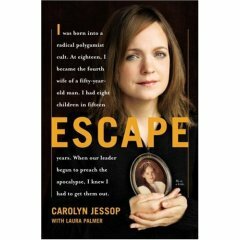 Author Carolyn Jessop was born into the FLDS and grew up in Colorado City, AZ. She successfully escaped from the group and lives elsewhere in Utah with her eight children. Her book discusses the abuse that she endured and her liberation from polygyny. Read reviews or order this book safely from Amazon.com online book store. The book is also available in paperback and audio formats. Apologetics Index has a 40 minute video showing Jessop discussing her life & book, and answering questions from the audience. See: http://www.apologeticsindex.org/ Apologetics Index is an evangelical counter-cult Christian web site.